When Santa Barbara jewelers Gregore and Jennifer-Rabe have the notion to create an elaborate and beautiful piece of jewelry it is for two reasons, because the impulse to create it is so strong and because intuitively they know others will derive joy from it also. The jeweled butterfly brooch came about when Gregore saw the opal in the rough. It was so beautiful he wanted to maximize the use of its size, and butterfly's are a popular theme for the Santa Barbara couple. The body came about because classic design houses like Cartier, and contemporary ones like Wallace Chan and J.W.Currens have used colored stone pave in ways that have inspired them. The sapphires set into the gold body are of many tones like pink, purple and blue. The metal surrounding them is blackened to enhance their color. The antenna are pave set with diamonds in the classic Gregore style, the tightly arched line. The Brooch is made with Opal wings and pave' with multicolored sapphires and diamonds. The Butterfly is fashioned in the Victorian style of trembleuse brooches, where the flowers or insects vibrate with the movement of the wearer. 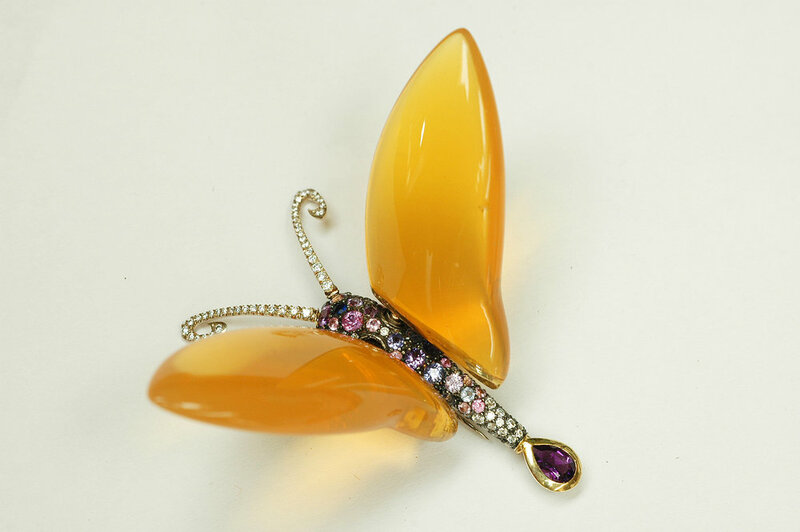 The wings on this jeweled butterfly vibrate as you walk, so make sure to see this in action in the video below. There is a spring coiled up inside the body that is allowing the movement of the attached wing. The flower is beautiful. We cut the petals out of black mother of pearl on the CNC machine following a model drawn in CAD. They were given a final polish by hand. The turquoise was cut for this project by hand and all parts joined together into a flower stand.